The name counts beside Altenberg. Herrenberg. chapel hill. Klosterberg. Rosenberg and Sonnenberg to the most common single layer designations in Germany. It occurs in 8 of the 13 growing areas around 50 times (see last paragraph). This makes Kirchberg the second most popular single-track name in Germany. The reason is in the many vineyard possessions of the church to see over centuries. The oriented to the south-southwest, and in a small area to the southeast vineyards with 10 to 35% slope cover about 90 hectares of vineyards on shell limestone soil. Here, for example, Müller-Thurgau and Schwarzriesling are cultivated. Shares in the situation have for example members of the WG Tauberfranken. On the summit of the Kirchberg is the cultivated Kirchberghäuschen. The aligned from south to west vineyard with 10 to 30% slope covers nearly five hectares of vines on skeletal granite weathering soil. 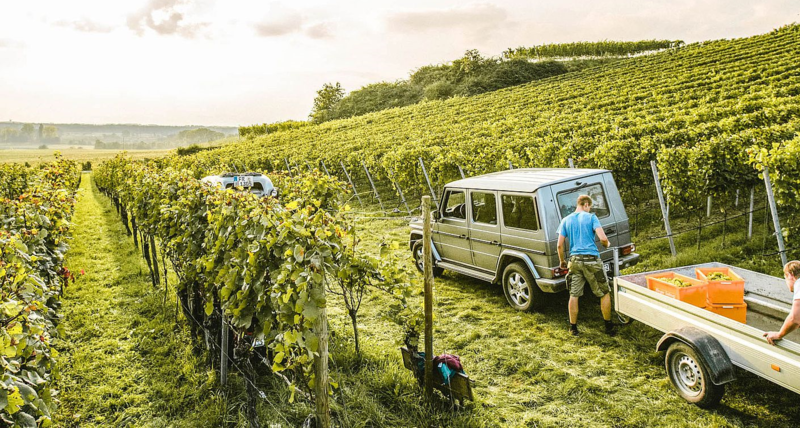 Here, especially Riesling is cultivated. A share of the situation has, for example, the winery of the city Bensheim. The oriented to the southwest to southeast vineyards with up to 30% slope include 42 hectares of vineyards on loess clay soil with yellow limestone. The best area is this won "Kalkofen". A share of the situation has, for example, the winery Schwörer Lothar. Other single layers called Kirchberg exist in the communities Astheim (Franconia), Barbelroth (Palatinate), Bingen and Kempten (Rheinhessen), Bönnigheim (Württemberg), castles (Mosel), Eckelsheim (Rheinhessen), Edenkoben (Pfalz), Efringen churches ( Baden), Esslingen (Württemberg), Frei-Laubersheim (Rheinhessen), Freudental (Württemberg), Gabsheim (Rheinhessen), Gleishorbach, Gleiszellen (Pfalz), Gottenheim (Baden), Großfischlingen and Kleinfischlingen (Pfalz), Hackenheim (Rheinhessen), Hohenhaslach , Hohenstein (Württemberg), Huttingen, Istein (Baden), Kirchheim (Württemberg), Kirchhofen (Baden), Könen (Mosel), Königheim, Königshofen, Kraichtal, Lipburg (Baden), Moselle (Mosel), Münchweier, Oberöwisheim, Obertürkheim ( Württemberg), Osthofen (Rheinhessen), Riet, Sachsenheim (Württemberg), St. Martin (Pfalz), Udenheim (Rheinhessen), Uettingen (Franconia), Unteröwisheim (Baden), Veldenz (Mosel), Waldböckelheim (Near), Wallburg (Baden ) and Würzburg-Heidingsfeld (Franconia). In the growing area Franconia There is also a large town Kirchberg. This page was last modified at 26 October 2018 at 09:05.